The recent book by Costas Lapavitsas, The Left Case Against the EU, calls for a rupture with the capitalist European Union and its institutions. 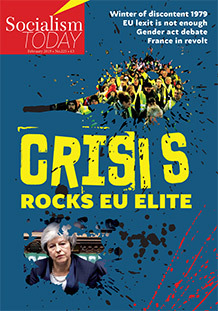 But it does not provide an all-rounded programmatic guide for the workers’ movement to the questions posed by the issue of the EU, argues CLIVE HEEMSKERK, particularly important now in the context of Brexit. The self-congratulations, usual at the end of UN climate change conferences, were hardly ever less justified than in Katowice, Poland, last December. The main business had been to adopt a ‘common rulebook’ for the 2015 Paris agreement, but the result was so full of evasions, buck-passing and ambiguities as to be practically worthless. PETE DICKENSON reports. Forty years ago a wave of industrial action – known as the ‘winter of discontent’ – would define the downfall of the then Labour government. JIM HORTON examines these events and considers the lessons for the labour movement today.